Former captain Steve James does not believe it is all "doom and gloom" at Glamorgan despite a disappointing season. Glamorgan won only eight of 38 games during the season and coach Matthew Mott admitted it had been a tough campaign. But ex-England batsman James says the emergence of several promising youngsters offers hope for the future. 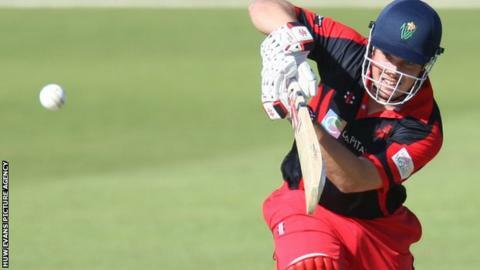 "Glamorgan are a much better side than they showed this year," James said. "I don't think it's all doom and gloom. "They got off to a poor start, lost some games maybe they could have won early on. They never really recovered. "Gareth Rees, he's a good player, but he had a very poor season. I don't expect him to have as poor a season next year. "Dean Cosker's a very fine spin bowler but he had a poor season as well. "I don't think we should underestimate the influence of Tom Maynard's death as well. That hit a lot of the players more than anybody's let on. "So maybe we should give the Glamorgan players a little bit of leeway in that respect." Seamer James Harris has confirmed he will leave the county at the end of the season while veteran Robert Croft has announced his retirement. But former England Test batsman James is looking forward to seeing youngsters Mike Reed and Andrew Salter play more prominent roles next season. Paceman Reed, 24, and 19-year-old all-rounder Salter have recently signed new deals with Glamorgan. "Obviously James Harris leaving is a disappointment," James said. "I went to watch the last game of the season against Kent down at Cardiff and I saw Mike Reed, the big tall fast bowler, bowl for the first time. "I was thoroughly impressed and found myself asking the question why hasn't he played more? "He's now signed a new contract so I expect to see a bit more of him next year. "I was very impressed with Andrew Salter when he played in the one-day games. I expect to see a bit more of him next year. "They've got the Australian [Michael] Hogan coming in as well. "They'll have Marcus North for more. We shouldn't forget he missed the start and missed the end."